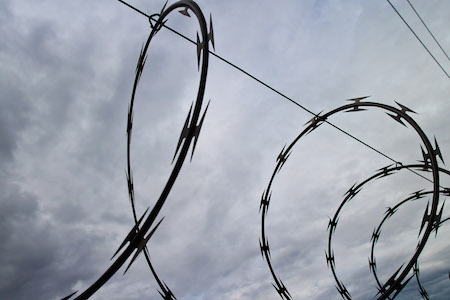 I never get used to the razor wire and clanging of metal doors when I visit Greensville, yet that is where I find peace with my Kairos brothers. You could hear a pin drop at our table at Greensville Correctional Center in Jarratt, Va. It was chapel time. Six residents and three volunteers sitting in a circle in a prison gym, leaning in to hear one of our Kairos brothers unburden his heart. “For a long time, I had a lot of anger…a lot of hate,” the man began. The words came out slowly, punctuating the silence, pulling us closer as he related his story. “You see that prayer chain,” he said as he pointed to a paper chain taped to the wall. The chain had hundreds of links, each one inscribed with the name of a person praying for the 42 residents who were part of Kairos 57. “There are different colors on that chain, and I could’ve been one of the white ones,” he said softly. The white strips on the prayer chain held the names of death-row inmates. His story tumbled out and his eyes moistened. It was a story like many I’ve heard in my four years as a member of the Northern Virginia Kairos prison ministry team. We tell the residents that what’s said at Kairos stays at Kairos, so we don’t share the details of what we hear. Except to say that it comes down to this: 10, 15, 20 or more years behind bars. Years of anger, doubt, fear, shame and every dark emotion you can imagine—all bottled up inside. And then, for many, freedom. You would think the prospect of release brings joy. Yet, they are afraid. Afraid of what they have become in prison, and afraid of what they will face when they go home. They don’t know if they can trust. They never could before. And yet they want to. They want to believe that there is a better way, a way to make peace with themselves, their families and each other. All weekend long, we shower them with our love and our prayers, our conviction that there is a higher power, a forgiving God who cares about them. We can’t change the nature of their crime or their sentence, but maybe, just maybe, we can change the condition of their spirit. Perhaps the seeds of trust and healing we’ve planted will grow, even in prison. I’m not a counselor or a chaplain. I had never even been in a prison, much less Virginia’s largest penitentiary, prior to signing up for Kairos. But it doesn’t take a PhD in psychology to figure out what these men are going through and what they need. We all have our doubts and misgivings, demons that tempt us, people we can’t seem to forgive, memories we can’t forget—the “what ifs” and “could haves” that haunt everyone’s life. We do not judge these men. By the same token, we do not coddle them. In fact, we teach them that we all make choices, and that we must accept the consequences of our choices. But we do share with them. We’re honest about our mistakes and our hopes and our dreams. We make ourselves vulnerable so that they might open up for a brief moment, long enough to let in some love that may just change their lives. We face the human condition straight on, and we come away understanding that we are all brothers. We all hurt. We all need comforting. We all need forgiveness—whether we live inside or outside the walls of Greensville. It’s been a year since I wrote about my last Kairos experience. It’s not an easy thing to write about. One of my friends who became active in Kairos before me said after he returned from his first weekend that he wasn’t ready to talk about it. He would get back to me, but he never did. When you enter a dark place and see the work of a loving God—the miracle of grace and forgiveness—what do you say? What do you say when you’re touched by Jesus, the holy spirit, or something you just can’t explain? When you see it at work, when you feel it, and you know it’s real? When you see the difference it makes? What do you say to someone on the outside to make them believe? You say that Kairos is a powerful experience, that it changes lives and that it’s a special time. Those are all true, but they only tell part of the story. It’s hard to put into words what really transpires. Sometimes you just have to let it be. This past weekend, the Kairos praise band performed one of my favorite gospel songs, “Break Every Chain.” As I stood and sang, I closed my eyes and said a prayer: Yes, break every chain. Break the chain of doubt and fear. Break the chain of ignorance and hatred. Break the chain of violence and abuse. Break the chain of darkness and death. Break all those chains, and replace them with a chain made of paper—a prayer chain stretched across a wall at Greensville Correctional Center—with the names of people who say, yes, God, I will pray for men I don’t even know so that they may live. This entry was posted in Purpose and tagged Break Every Chain, God, Greensville Correctional Center, Kairos, prison ministry. Bookmark the permalink.